If you want to for a feminine and romantic look for this spring, choose lace. This is a really popular fashion trend for the upcoming season. You can see lace decoration in all clothing pieces and fashion accessories. In this post, we will give you a few ideas how to wear lace this spring and summer. The lace trend has reached a new level of sophistication for 2014, increasing its timeless beauty, even though it seemed impossible. It can be used as a feminine accent or sported in an overall look to add elegance to every outfit you choose to wear. Lace in very versatile and can be used with attractive color palettes, in a long line of refined silhouettes and cuts. Lace clothes, envisioned for a smooth transition between day and night, become even more irresistible this spring. Following the fashion trends for spring 2014, you should make this delicate and beautiful material a substantial part of your wardrobe. Especially considering that it has proven its relevance over and over again through the seasons. All white lace dresses and outfits are an ideal choice for the spring and summer of 2014. You can choose beautiful tops, elegant ensembles and feminine dresses to integrate the white color and the lace material into your wardrobe. This trend is for those of you, who are willing to fully embrace their feminine side. Lace can also be seen in many delicate pastels too. Subtle shades of powder blue, lilac and light yellow perfectly complement this season’s gentle take on lace. Follow the latest fashion trends, shown on runways and choose an elegant lace dress in pastel colors, which flatters your figure. Last season we saw that lace can also be integrated in bold and unexpected color palettes. For the spring of 2014, this material is used with a selection of beautiful jewel tones, like emerald green, fuchsia and cerulean blue. If you want to wear lace during the day, it’s best to keep things simple and basic. Wear a lace pencil skirt with a classic button-down shirt, a lace top with a blazer or an elegant lace dress, which is not too revealing. These are just a few examples how to integrate this delicate material into your daily outfits for a more feminine look. Lace can make an impressive fashion statement in the evening wear. 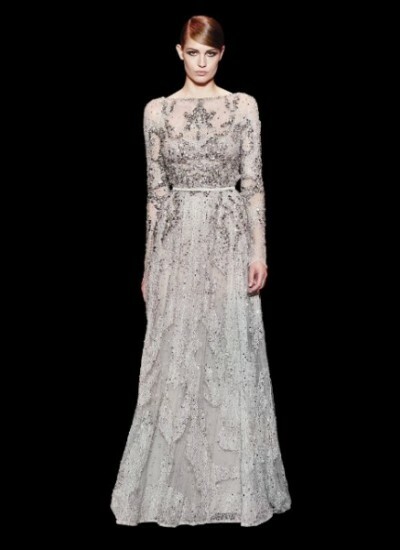 Lace evening gowns embody glamor, romance and sensuality with ease. The best thing is that you don’t need to many accessories for these evening dresses – just a simple hairstyle and beautiful, natural looking makeup. Spring 2014 brings to everyone’s attention a particularly exciting take on the lace trend with fashionable pieces with fine details. This delicate fabric is used on everything – from transparent trousers, through chic tops, to various fashion accessories. You have many options to add lace to your spring wardrobe.